Cecil McBee, bass; Al Foster, drums. As soon as she begins to play--indeed a few moments before, because of the anticipation--the air is charged at a Joanne Brackeen performance. She is a continually, sometimes overwhelmingly, exciting player because there is so much energy in her inventions, so much infectious delight from continually surprising herself and her musicians. And there is so much feeling, all kinds of feelings. As she says, "Music is very direct, it's nothing abstract." In this set, the excitement takes on new dimensions, for this is Brackeen's first album as a leader with a quintet. And her sidemen have both the temperament and the chops to deal fully with the intricate challenges of her music while also challenging her. Terence Blanchard and Branford Marsalis are among the more compelling and constantly evolving jazz creators of the 1980's. Marsalis's horn is customarily the tenor saxophone, but Joanne had an alto sound in mind for this music. "He hadn't played the alto for years and years," she says, "but Branford, like Terence, fitted in right away even though my music is different from what they've been playing." Cecil McBee, one of the most wholly musical (and undersung) bassists in jazz, has worked often with Joanne, and Al Foster had long wanted to perform her original compositions with her. The way both of them play throughout this album recalls what Duke Ellington used to say about the qualities he looked for in a musician. "Very important" Duke would say, "is someone who knows how to listen." I asked Joanne about the tunes--Brackeen originals and three standards. With her, the music usually comes first, then the title. "Estilo Magnifico" (The Magnificent Style) got its name because Joanne felt that the tune sounded like it ought to have that kind of title. The song has that authoritative fusion of vibrant sound and leaping time that are Brackeen characteristics. "Stardust" and "Hear A Rhapsody" are favorites of Joanne's. She infuses these standards with such lyrical intensity that they become quite transformed, without in the least distorting the mood and memories of the originals. 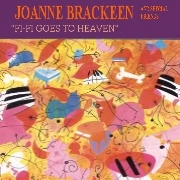 "Fi-Fi Goes To Heaven" is in commemoration of a little dog, Fi-Fi, a Yorkie, who was a companion of Joanne's. Fi-Fi had abundant energy and, Joanne says, "got to everybody's heart." "Zingaro" has long attracted Joanne because of its "haunting melody" and because of the haunting way the Jobim melody was sung by his compatriot, Joao Gilberto. "I phrased it," she says, "somewhat the way he sang it." "Cosmonaut" has sections, Joanne notes with satisfaction, "in which the whole band takes a solo at the same time." Joanne does not know "Dr. Chang" personally but she admires the herbs and teas he and his company send out from San Francisco. "They're hard to get," she says, "but they taste so good." Each new Brackeen album reveals more of her discoveries in and about music. And the revelations never cease because, she points out, "music exists and is just waiting to be discovered. It's like the laws of science; they operate all the time but we have to 'discover' them to be aware of them." One of the things that makes Joanne so unusual is that she lets the music come to and through her. There are no barriers made up of labels and categories. She is open, as in this album, to whatever is waiting to be discovered.